Palace on Wheels, a luxury train of India may soon bring another glory for the nation. Pacific Area Travel Writers Association (PATWA) has nominated the POW for the PATWA International Award under the category of ‘Tourist Train of the Year’. Results however will be announced during ITB Berlin to be held on 9th March 2018. Pradeep Kumar Borar, special secretary and director of tourism stated that besides offering the best hospitality, Palace on Wheels has achieved the highest occupancy. He also confirmed that the train has been nominated for the PATWA International Award under the ‘Tourist Train of the Year’ genre. One of the prestigious luxury train of India, Palace on Wheels started its maiden run on January 26, 1982. The train was incepted with an aim to boost tourism in Rajasthan. Since then, it is treating its passengers with a royal ride showing various hues of the vibrant state. 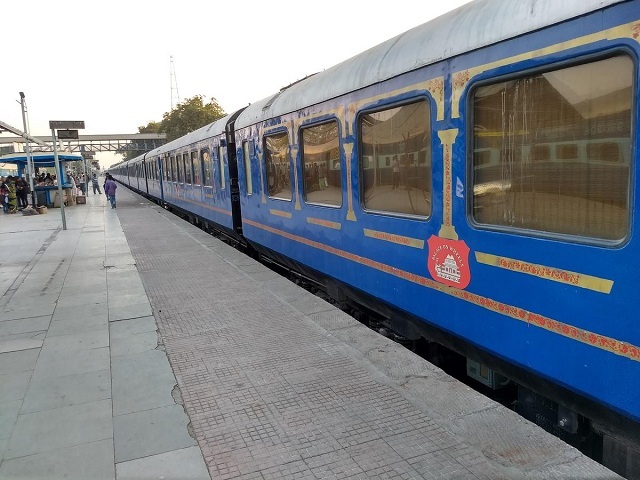 Palace on Wheels Train boasts of the royal coaches of the erstwhile rulers which allow visitors to traverse the Golden Triangle Circuit, Udaipur, Jaisalmer, Jodhpur and Sawai Madhopur. This voyage undoubtedly proves to be one of the world’s most enthralling train journeys. Showcasing the excellent hospitality as its USP, the train has gained worldwide reputation for providing the sojourn of a lifetime to the passengers. The luxury train has already added a star to its profile by winning the PATA Gold Award in 1987. 2010 also brought much of the fame for the POW, as it was voted are the 4th most luxurious trains in the world. Rajasthan itself is a wonderful royal place to visit, that too in luxury train. Its Awesome!